I’ve been trying my best to eat quite healthily lately, yet I’ve struggled for some good breakfast eats. I love oatmeal, but I’m always looking for new ways to make it interesting. I recently discovered a pretty awesome recipe for some baked oatmeal, and I’ve changed it up a bit to make it my own. Lemme share it with you!! Hope you like it! In an oven safe, non-stick bowl mix egg and honey. Add the melted butter little-by-little so that you don’t cook the egg. Add oats, baking powder, salt, cinnamon, vanilla, and vanilla almond milk. Stir until well combined. Add blueberries and walnuts. Bake oatmeal in the oven safe bowl for 35-40 minutes at 350 degrees. Sprinkle the top with a little brown sugar or some extra honey when serving. My recipe is for either a double serving or just one big serving (which is more likely). AND IT’S DELICIOUS!!! Hope you like it. 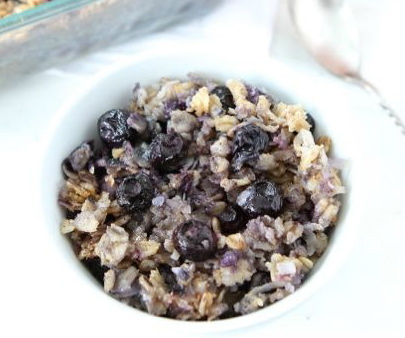 Do you know any baked oatmeal recipes?